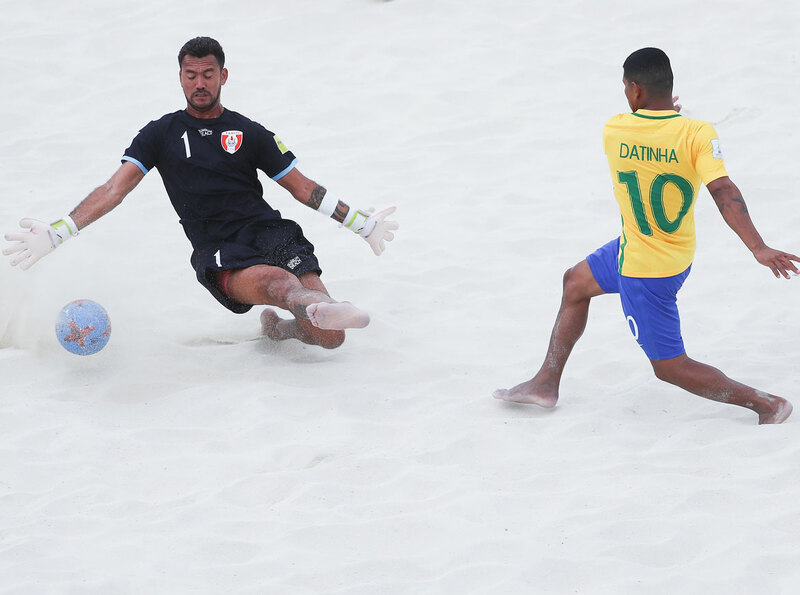 Brazil were crowned FIFA Beach Soccer World Cup champions for a record fifth time at Bahamas 2017 after a 6-0 victory over Tahiti in the final in Nassau. The South Americans needed just 14 seconds to open the scoring as Mauricinho notched them ahead following a lightning-quick turnover in Tahiti’s half. Mauricinho then turned provider as he assisted Datinha, who finished from close range to double their lead. Teva Zavaroni had a golden opportunity to head in Tahiti’s first of the match late in the opening period but Brazil’s backline did just enough to put him off and keep their two-goal lead going into the second period. Brazil extended their advantage midway through the match as Mauricinho doubled his tally, having seen Datinha return the favour for his earlier assist. The 27-year-old dispatched the opportunity impressively with the outside of his right foot. Catarino made it four for Brazil with a low left-footed drive that found its way into the bottom corner to seal the deal for Gilberto Sousa’s side. To add gloss to the result, Daniel lost his marker and ghosted in at the back post to be picked out by Rodrigo on a corner kick. He then doubled his tally just over a minute later with an assured, left-footed finish. Tahiti coach Teva Izail said the Tiki Toa knew they would be up against it going into the final against a classy Brazilian side, determined to take out their fifth FIFA Beach Soccer World Cup title. “In all the matches Brazil has played here at the World Cup they haven’t lost and we knew they would be strong,” Izal said. “We played with our hearts, we played for our country – we did our best.